Images of the unmanned craft released by Israel's military resemble a U.S. stealth drone captured by Iran in 2011. Israel said the drone, operated by Iran from a Syrian base, traveled into its territory. Jerusalem: The drone that Israel said it shot down this weekend appeared to have been developed by Iran from technology obtained when it captured a U.S. stealth aircraft in 2011, according to aviation experts and Israeli officials. Lt. Col. Jonathan Conricus, a spokesman for Israel's military, and Yuval Steinitz, a minister in Israel's security cabinet, said the craft was a copy of a U.S. RQ-170 Sentinel spy drone, which Iran claims to have reverse-engineered. Experts who examined footage of the drone being shot down and images of its wreckage released by the Israeli military agreed that the shape strongly resembled that of Iran's Saeqeh, or "Thunderbolt," drone, which was based on a CIA-operated RQ-170 captured by Iran. Conricus said that he could not specifically confirm that the drone was a Saeqeh and that the debris is still being examined. Iran has developed several other models based on the RQ-170. "It was an Iranian copy of a U.S. drone that they got hold of a few years ago and they duplicated," Steinitz told Israeli radio. Israel said the drone, operated by Iran from a base inside Syria, traveled three or four miles into its territory Saturday morning before being shot down. Iran has described the Israeli claim as "ridiculous." A spokesman for U.S. Central Command, which oversees U.S. military operations in the Middle East, declined to comment. The incident sparked a flurry of cross-border confrontations that resulted in an Israeli jet being shot down for the first time since 1982 and Israel's most extensive bombing of Syria in that same period. The U.S. RQ-170 drone captured by Iran in 2011 was part of a fleet of secret aircraft used by the CIA in an espionage campaign targeting Iran's nuclear facilities, according to U.S. officials who spoke at the time. Iran claimed to have downed it with an "electronic ambush." The United States later requested that Iran return the drone, but Iran said it should apologize for invading its airspace instead. The U.S. drones are mainly used for surveillance and reconnaissance and can be equipped to capture a range of intelligence material. Iran first tested its own version of the RQ-170 in 2014, and its elite Revolutionary Guard Corps unveiled the Saeqeh in 2016. Those unmanned aerial vehicles boosted the ambitious drone program the country has maintained since the 1980s, when it first deployed the craft during the Iran-Iraq War. Its arsenal now includes surveillance and attack drones that have been used from Pakistan to Syria to the Persian Gulf, despite years of international sanctions. In Syria, where Iran is providing military support to President Bashar al-Assad, it has conducted air-to-ground strikes, according to experts. Iran said the Saeqeh can carry four laser-guided bombs, although experts have said it may not be able to maintain its stealth capability while armed. Iranian leaders often exaggerate the country's military prowess. The Israeli military has declined to comment on whether the drone that was intercepted Saturday was armed but said it was on "a mission." 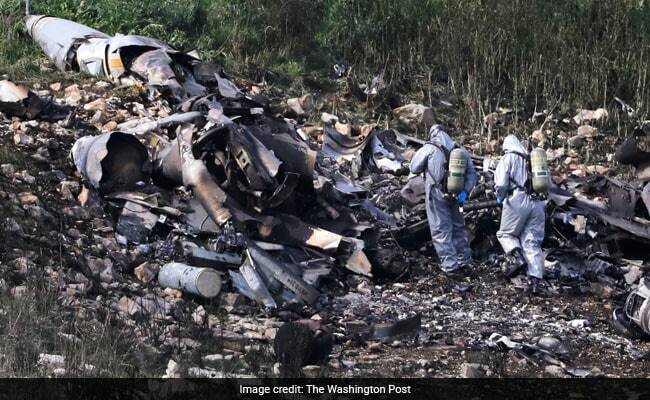 Israel has carried out regular bombing raids inside Syria in recent years to contain what it says is the growing presence of Iran and its proxies, and officials said Sunday the drone proves that their warnings about Iran were justified. "It was not an attack, but a test of the limits and rules," said Chagai Tzuriel, director general of Israel's Intelligence Ministry, referring to the incursion. "For the Iranians, there is nothing better than to test the limits and get away with it, and that's why we should not let them." Wim Zwijnenburg, coordinator for the European Forum on Armed Drones, said that footage released by Israel of the drone being shot down Saturday was notable because the craft's triangular shape did not resemble anything Iran is known to be flying over Syria. "It would be a new development if they were flying these around," Zwijnenburg said. The RQ-170 is designed to evade radar, made of materials that absorb, rather than bounce, the radar signal, but it is possible Iran has not been able to replicate that capability, Zwijnenburg said. "They could have been testing air defenses or trying it out," he said. "If it was trying to evade radar it would have to be flying low, and from the video it looks to be flying low." He said that judging from video it has released, Iran appears to have built about a dozen Saeqehs. The Israeli military said the drone it shot down had a wingspan of about 85 feet. The Lockheed Martin RQ-170 has a wingspan of about 66 feet. Tal Inbar, head of the Space and UAV Research Center at the Fisher Institute for Air and Space Strategic Studies, said the similarities were clear. Syria, he added, is "a laboratory for Iran to test out new weapons and new tactics." The Washington Post's Erin Cunningham in Istanbul and Paul Sonne in Washington contributed to this report.